Though the ingredient list is long, this is not a complicated dish to make. This dish is more mild than spicy, when cooked as is. Feel free to fiddle with the recipe, substituting chicken thighs rather than breasts (or even cauliflower and potatoes for a vegetarian version), making it spicier (more chiles), or creamier (additional coconut milk). Serve with rice for a meal in a bowl. Put the cardamom pods, cloves, cinnamon stick, and oil in a large pot or deep-sided skillet and sauté over medium heat until fragrant, 30 seconds to a minute. Add onions and cook, stirring often, until they turn golden brown. Add ginger and garlic and cook for 1 or 2 minutes, stirring constantly. Add cumin, chile, and coriander, stir, and cook for 30 seconds. Add chicken, tomatoes, mint, bay leaves, yogurt, and water. Bring to a boil, then turn down to a simmer, cover, and cook until chicken is done, about 30 minutes. Remove lid and add coconut milk and salt to taste. 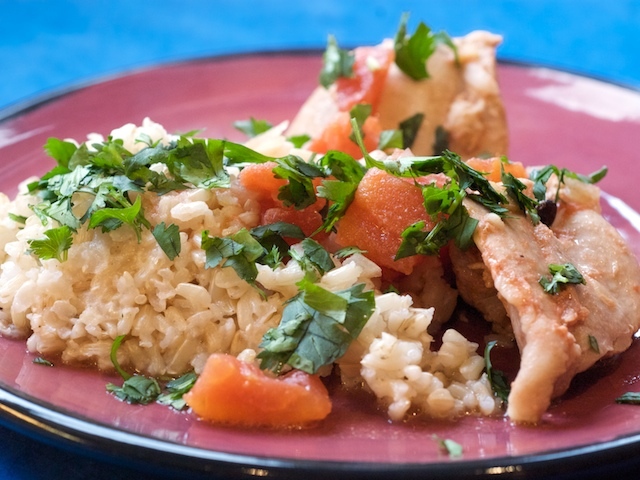 Serve warm, garnished with cilantro, with rice or naan. Read more about the aromas and pleasures of Indian food.